Despite the gains that India has made over the past 20 years, it remains a country with extreme gender inequality. It is one of the most challenging countries to be a girl or woman, ranking 127 out of 160 on UNDP’s gender inequality index. This is a reflection of the gender-based discrimination that girls and women face throughout their lives. The evidence of it is pervasive and unsettling: relative to their male counterparts, girls in India endure disparities in secondary education and employment, are at a higher risk for violence, and experience a higher incidence of health problems. Our programming under the auspices of Girl Rising India is diverse, yet all focused on shifting the mindsets that have long prevented India’s girls from pursuing their dreams. For use in India, the Girl Rising film was revisioned in English and Hindi and voiced by Bollywood megastars. It broadcast on television to millions of people and continues to reach tens of thousands more through community, educational, corporate and NGOs screenings. Our widely-distributed PSA campaigns – including We Dream, We Rise – encourage audiences to break away from stereotypes and dream equally for girls and boys. The social media campaign reached 25 million people. Our partners integrate custom Girl Rising media and curricular tools into programs designed to unearth local solutions to the girls’ education crisis. Together, we encourage individuals of all ages to consider the benefits of quality, inclusive education and the role they play. In 2017, we launched a 24-week gender sensitization curriculum designed to reach 45,000 students and 1,700 teachers. The curriculum empowers participants to address local norms, question stereotypes and drive change within school environment, families and in communities. (See results of the evaluation below). Prime Minister Modi, Freida Pinto, and the Girl Rising Team. We collaborate with local religious and political leaders through special screening and discussions, recognizing that change must happen at all levels. We continue to work with India’s Ministry of Women and Child Development’s Beti Bachao, Beti Padhao (Save Girl Child, Educate Girl Child) campaign. Together, we distributed mass media content on television, radio and in cinema halls, including in 161 high priority districts where female feticide, infant mortality and lack of access to education are critical issues. Looking to learn about the change we’ve seen? Explore the documents below for a look at our mass media and programmatic interventions in India. Special thanks to The George Washington University and Fluent Research for leading our evaluation efforts. 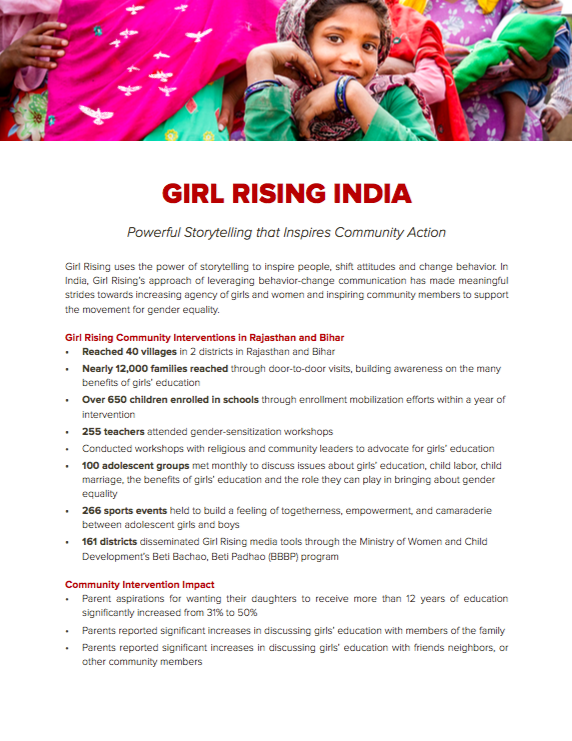 Girl Rising India is a registered non-profit whose mission is to use the power of storytelling to change mindsets that have long prevented girls from being full and equal participants in society. In 2018, Girl Rising India partnered with Global Health Strategies (GHS) to expand both organizations’ network, reach and impact. Headquartered in New Delhi, GHS uses advocacy and communication to improve health and well-being around the world, and firmly believes in enabling access to high-quality care for girls and women across the globe. With renewed expertise and rigor, Girl Rising India continues to implement on-the-ground interventions that leverage its unique media tools and curriculum and seeks to ensure girls in India receive the skills, education and support they need to reach their full potential. From 2014-2017, much of our work in India was made possible by USAID through ENGAGE (Empowering Next Generations to Advance Girls’ Education), a public-private partnership designed to close gender gaps and improve girls' lives. The work continues thanks to the generosity of private donors, government grants, corporations and more. Sign up with your email address to receive Girl Rising news and updates.